Theatre Royal Friends, staff and dignitaries including The Lord Mayor of Norwich gathered today to say a formal farewell to departing Chief Executive Peter Wilson, who has been at the helm of the Theatre for 25 years. During Peter’s time at the Theatre Royal the Norwich venue has become one of the most successful outside London, with regular visits from the country’s finest touring companies, including Glyndebourne Opera, The Northern Ballet and the Royal Shakespeare Company. Warm tributes were paid to Peter by stars and staff alike and the gathering was introduced to his successor Stephen Crocker, who will take up the post after Peter finishes just before Christmas. Tributes were paid by many popular stars, including Martin Shaw in the theatre and Stephen Fry by video link from America. There was a particularly heartfelt tribute from Nimmo Twins star ‘She Go’, who gave a frank account of the ins and outs of a very special relationship with Peter. During Peter Wilson’s time in charge the theatre has developed in both its buildings and the scope of its programming. A theatre which once depended on subsidies is now thriving financially as well as culturally. Friends were told about the successful new ‘Stage Two’ theatre education centre, recently completed, and the turnaround at Norwich Playhouse which now has a secure future under the Theatre Royal umbrella. Past Chairmen of the Theatre Royal Trust and local council officers gave a clear picture of a man who did much more than just manage a theatre very successfully, a man who gave support and encouragement to the arts across the County and the region. Peter began his theatrical career in the mid-70s working at The Bush Theatre, the Haymarket Theatre, Belgrade Theatre in Coventry, the Crucible in Sheffield, and the Lyric Hammersmith. He co-directed Griff Rhys Jones’ Olivier Award-winning performance in Charley’s Aunt, and it was co-producing Ben Kingsley in Edmund Kean in 1983 which gave him his first experience of West End and Broadway producing leading to the birth of his London-based company PW Productions. PW Productions have now been providing production and management services for plays in London’s West End, on tour and internationally for around 30 years being responsible for around 100 shows – most notably An Inspector Calls, co-producing Matthew Bourne’s new production of Sleeping Beauty, and The Woman In Black, all of which have graced the Norwich Theatre Royal stage. In 1992, he became the chief executive of Norwich Theatre Royal and has overseen a number of expansions and improvements to the building including the seven-month renovation in 2007 which extended the front-of-house facilities, improved accessibility and transformed the acoustics in the auditorium to provide CD-quality sound in every seat. He was responsible for the creation of The Garage, with funds from the New Deal for the Communities, channelled through the North Earlham, Larkman and Marlpit Development Trust, and for assuming management control of Norwich’s Playhouse Theatre, which prior to the Theatre Royal’s involvement had been failing and is now in healthy surplus. Most recently, he oversaw the creation of Stage Two, the theatre’s new learning and participation centre. As well as being the new home of the theatre’s own arts courses, it is also hosting a new technical theatre course being run by Access To Music, a successful week of training for young people run in partnership with the Prince’s Trust, and many community events including family workshops and a launch for Northern Ballet’s forthcoming production Casanova. Although he will handing over the reins of the theatre to new chief executive Stephen Crocker, Peter will continue his West End work and will also maintain local links through his chairmanship of the High Tide Festival in Suffolk and play a leading role in the organisation and logistics of future exhibitions at Houghton Hall. The theatre is also performing well when compared with 14 others of a similar size and type across the UK. Its average capacity sold across the year was 69 per cent, ten per cent higher than the average in the survey representing ticket sales of over 400,000, over 120,000 higher than the average. The number of Friends of the Theatre also remains high with 11,445 members, which is over 8000 over the national average. 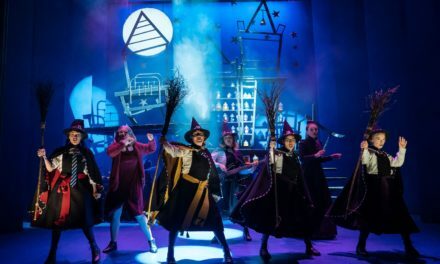 Support from the business community is also high with £41,600 coming from membership of the theatre’s corporate club, which is almost £10,000 over the average. Ahead of new chief executive Stephen Crocker taking the reins of the theatre in early January, Peter admits it is always hard to predict the future in the theatrical industry. He said: “I said last year that our relatively poor 2014-15 results were a useful reminder of the fragility of the theatre business and I make no apology for repeating that warning. Peter Wilson is man whose contribution to Norwich has helped this city live up to the ‘Fine City’ promise, and we are happy to add our voice to the hundreds who say ‘thank you, Peter’.